Replayer is a tool developed to support the understanding and development of mobile technology. It can be used by computer scientists, social scientists, or interdisciplinary groups engaged in studies into the use of mobile technology. The work was supported by Equator and the ESS project Integrating Field and Systemic Data in a Visualisation for Collaboration. I designed and implemented Replayer along with Paul Tennent. As mobile computing technologies become more common, there is an ever-greater interest in evaluation and analysis of such systems. Evaluating the use of large, multi-user, mobile systems can be a challenging task and can be aided by analysing both system generated logs of activity and video of user behaviour. Replayer provides a distributed, cross platform toolkit for utilising multiple coordinated visualisations in the analysis and understanding of these heterogeneous forms of data. 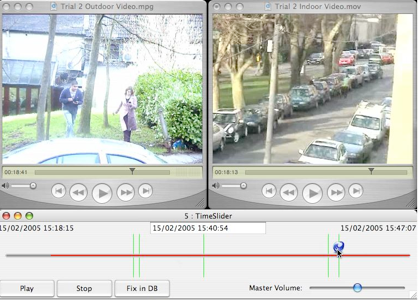 Replayer can be used to explore data sets using an array of available visualisations, can focus analysis of video data on the most salient periods and can provide context for every area of the recorded data. Proc. 5th International Conference on Pervasive Computing ,109-126, 2007. Computer Assisted Recording, Pre-Processing, and Analysis of User Interaction Data Workshop at HCI, 2006. Proc. 4th International Conference on Coordinated & Multiple Views in Exploratory Visualisation, 91-102, 2006. CHI Information Visualization and Interaction Techniques for Collaboration Across Multiple Displays Workshop, 2006.